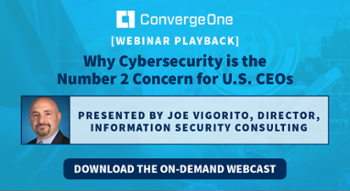 When protecting information means everything to your organization, ConvergeOne is right beside you as you develop a clear path for your cybersecurity plan. Attackers today are more pervasive, persistent, and proficient than ever at evading and disrupting traditional cybersecurity infrastructure. Are you taking the appropriate precautions? We can provide you with all the traditional cybersecurity measures, such as a firewall for your network, as well as Secure Socket Layer (SSL) and Cisco’s proprietary Adaptive Cybersecurity Appliance (ASA.) You can sleep tight at night knowing there are no monsters under the router. You need to maintain a watchful eye on the things that matter to you the most – and setting up your cybersecurity system accordingly. It’s also important, however, to maintain a vigilant watch for the latest in malware as well as potential new cybersecurity developments. We can provide you with a thorough risk mitigation plan. 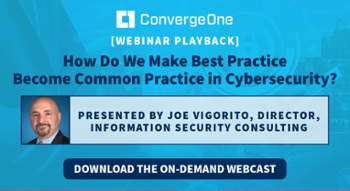 Effective risk reduction requires a solution that combines multiple trusted cybersecurity technologies working together. Protection for an organization’s critical information assets includes secure firewall, application cybersecurity and intrusion prevention capabilities in a single platform. 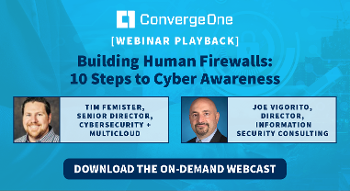 A reliable network firewall solution from ConvergeOne helps your company keep unauthorized visitors from accessing valuable business resources. Instead of providing only point products that set a base level of security, Cisco’s ASA embeds network firewall security throughout the network and integrates security services in all its products. As a result, network firewall security becomes a transparent, scalable and manageable aspect of the business infrastructure. Risk management means your disaster recovery plan supports every level of your enterprise before, during and after — protecting people, processes, data and infrastructure in the event of the unexpected. With disaster recovery, it’s not enough to have an insurance policy in place to recover things that may be lost if disaster strikes. The right disaster recovery plans, like the ones ConvergeOne can provide, support every level of your enterprise – people, processes, data and infrastructure – from before the event occurs all the way through to the aftermath. That involves everything from business continuity assessment and planning, to network availability and data continuity, to recovery and crisis management. Going down or slowing down can seriously affect your revenue or even your organization’s long-term survival. We provide IT and infrastructure risk management and business resilience expertise to assess the range of risks to the IT resources and assets on which your business processes depend. Ensure that your business processes and systems are able to predictably recover from and respond to disruptive events anywhere within the enterprise.